What is a laptop cooler ? The more powerful a system is, the more heat is generated. In order to avoid overheating and thus serious damage to the laptop, special cooling units, also known as coolers, are used. These are specifically designed for cooling microprocessors. The cooling unit consists of a heat sink and a fan. The fan, consisting of a fan and a case, generates an air flow that is pushed through the heat sink and removes the waste heat from the notebook. The material of the heat sink usually consists of aluminum, which is particularly light and inexpensive. The other variant is with copper, which is more expensive because more material is used. A combination of both are the so-called hybrid coolers. How do I detect a defective cooler? Over time, the cooler wears out. Especially the ball bearing of the fan is susceptible to wear and tear or can get stuck. A broken radiator can be recognized by a loud rattling or you can't hear anything that indicates a jammed fan. If the cooling fails completely, the laptop turns itself off after a while to prevent overheating. 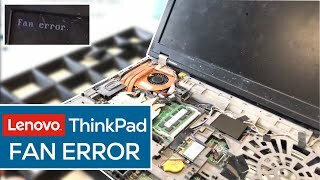 If the cooler is defective, don't hesitate and replace it as soon as possible, as the mainboard and the entire notebook can suffer enormous damage due to overheating. What do I need to look out for when buying a notebook cooler? Not every cooler is suitable for every notebook, there are differences in fit and connections. Depending on the equipment of the notebook, different coolers are installed by the manufacturer. Therefore you should exactly compare the mounting points and the design of the coolers with your order. If you want to order a cooler or fan from us in our shop, then do not use the OEM number of the cooler. It is not guaranteed that the cooler fits 100% to your notebook model. The simplest way is to order using the part number that can be seen on your defective cooler. Another possibility is the model search in our shop, where you will be shown the suitable coolers for your notebook model. You can also filter the coolers according to their intended use. A distinction is made between CPU, GPU, chipset, UMA and DIS. Can I exchange the cooler myself? Whether you can replace the cooler/fan of your notebook yourself depends entirely on how the cooler is installed in the respective notebook. Often you only have to open the cover and disconnect the power supply of the fan from the mainboard. Then the screw connection of the cooler can be removed. In some cases, however, the cooler can be very complicated to install, so you should rather leave it to an expert. In this case our in-house repair service will help you. Simply send us your notebook and we will replace the defective cooler.